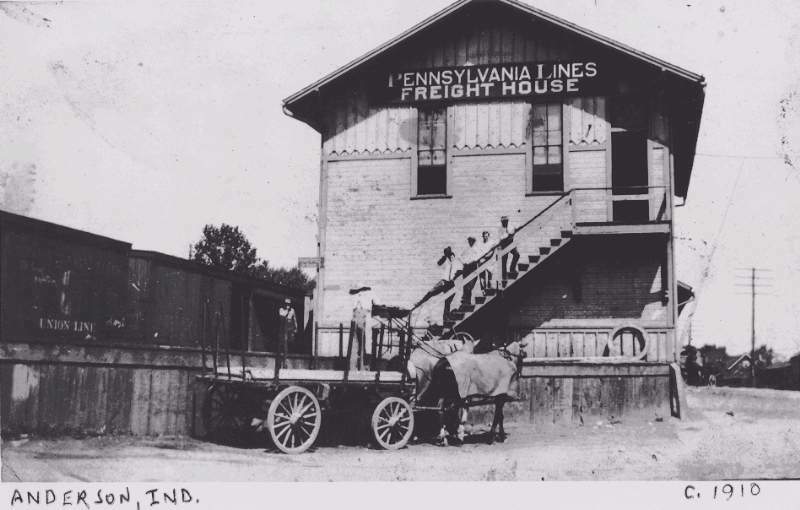 Here is a photo I found taken about 1887-1900 showing a Livery Stable where the Grain and Coal deales would be later. 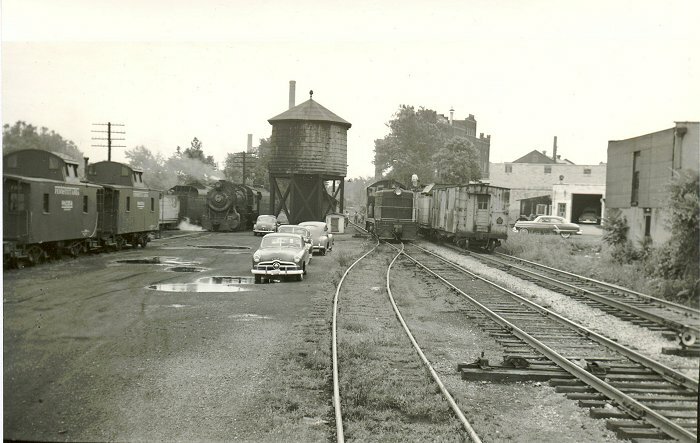 This is between the depot and St. Mary church. 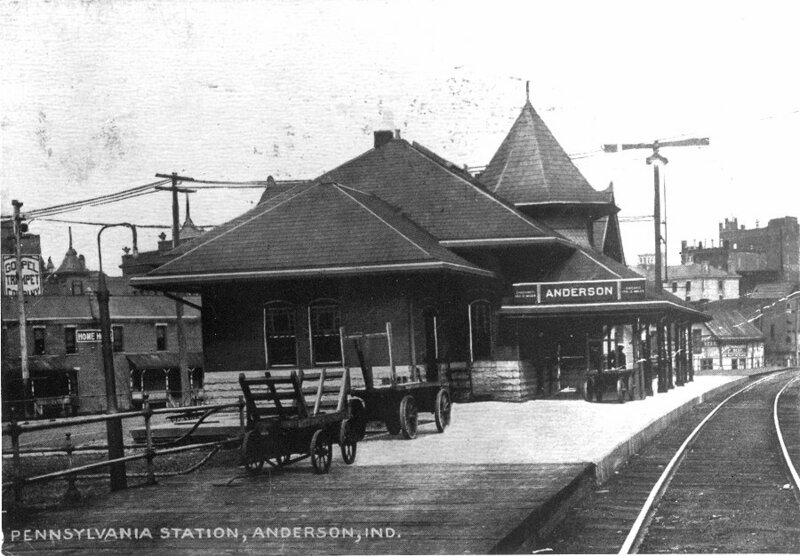 The Pennsylvania station at 9th and Fletcher. 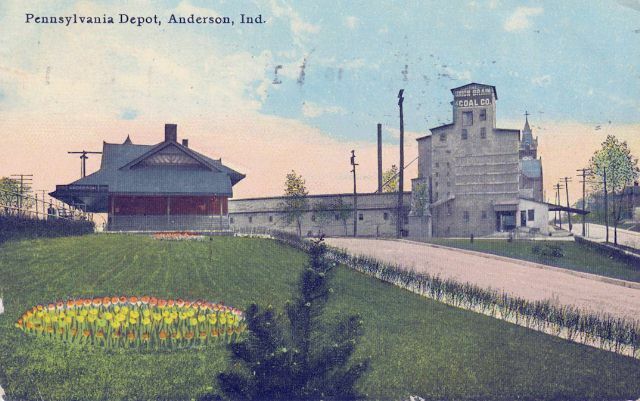 In the back right is the old Madison County Jail (white building) and the Norton Brewing Co. which was the Ralston Purina feeds in the 50s. 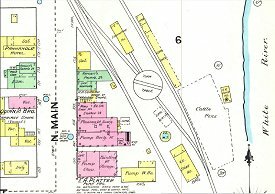 Across the street were hotels and small shops that catered to the traveler in better days. Note the 'Home Made' and Gospel Trumpet signs. 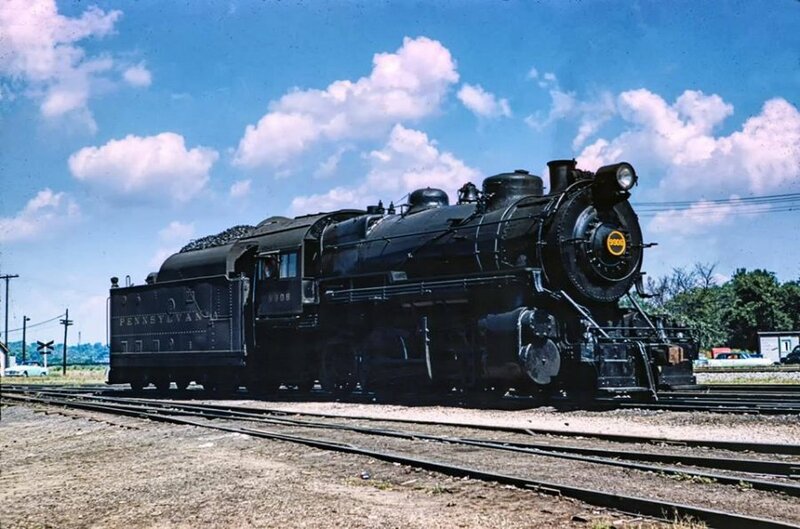 Postcard Photo - Roger Hensley Collection. 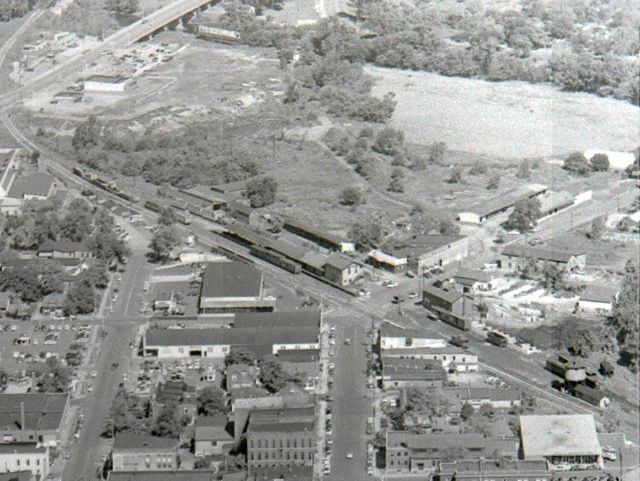 I've never seen those buildings South of the station. 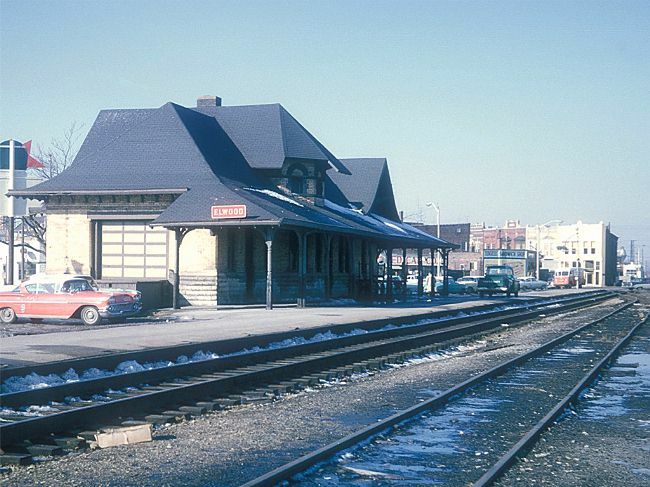 This is the PRR Passenger Station at 9th and Fletcher Streets in Anderson from the North side showing Union Grain and Coal and St. Mary's steeple in the background. 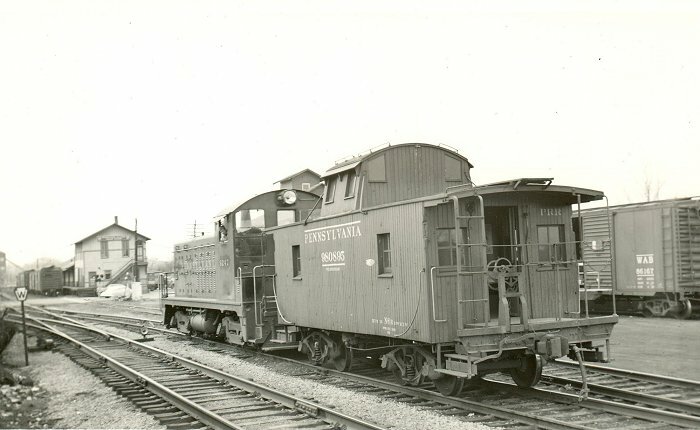 - Bradford Douglas Collection. And this one just came to me from Mike Hayes. 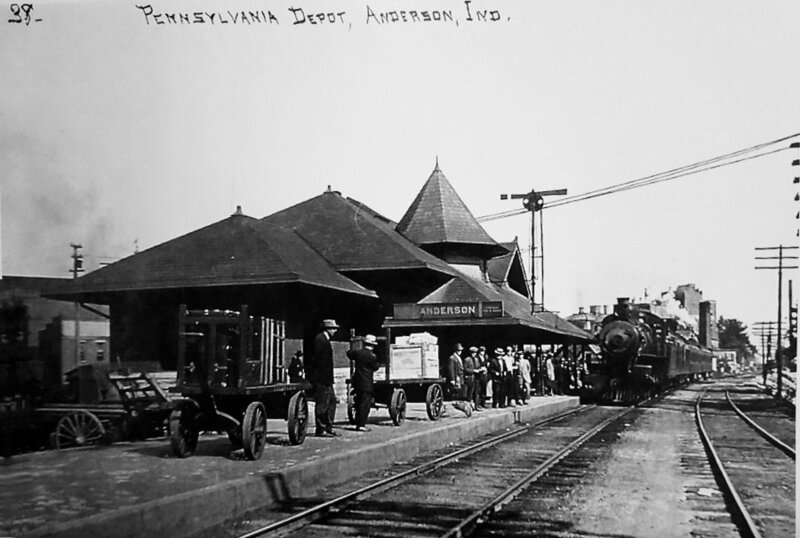 He sez: "Here is a different picture of Anderson PRR depot with more action. I bought this off Ebay from a guy in Australia. Photographer unknown. 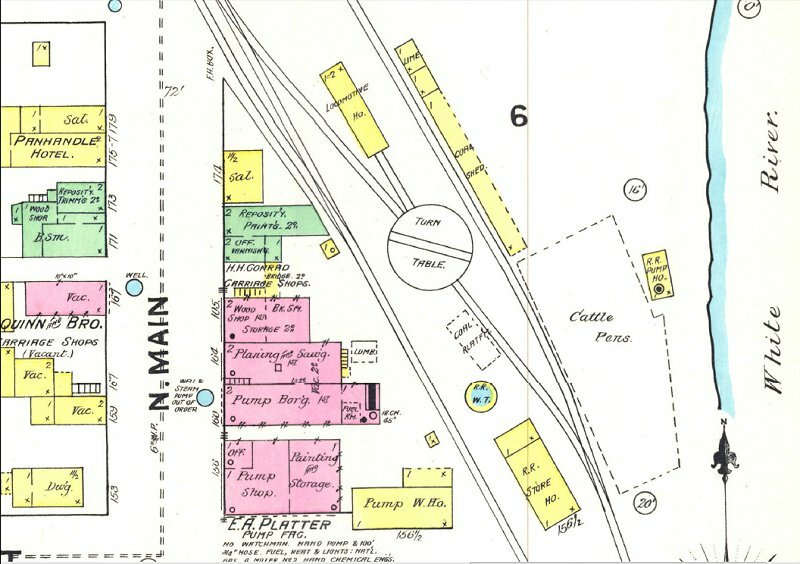 It's approximately 1910 to 1915." 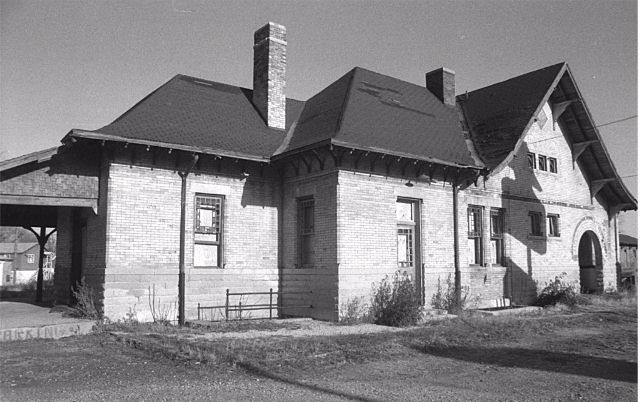 This is the PRR Freight House at 5th and Main (just north of the intersection). 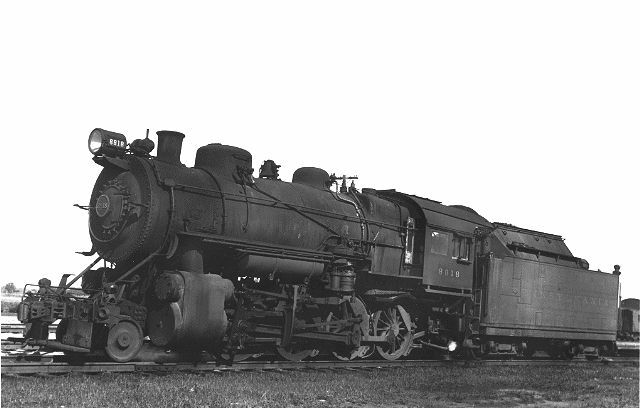 It is listed as being 1910. 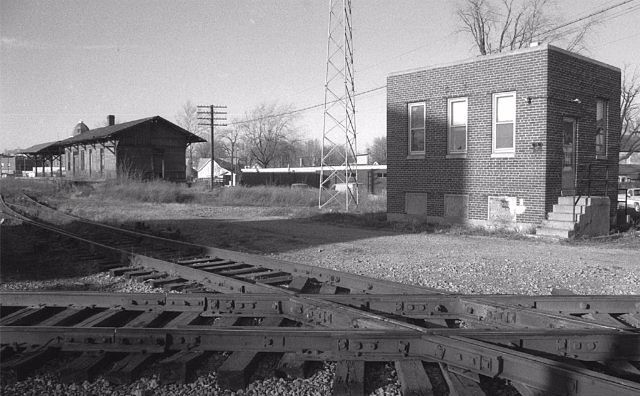 The building is long gone, but there are still tracks showing through the pavement. 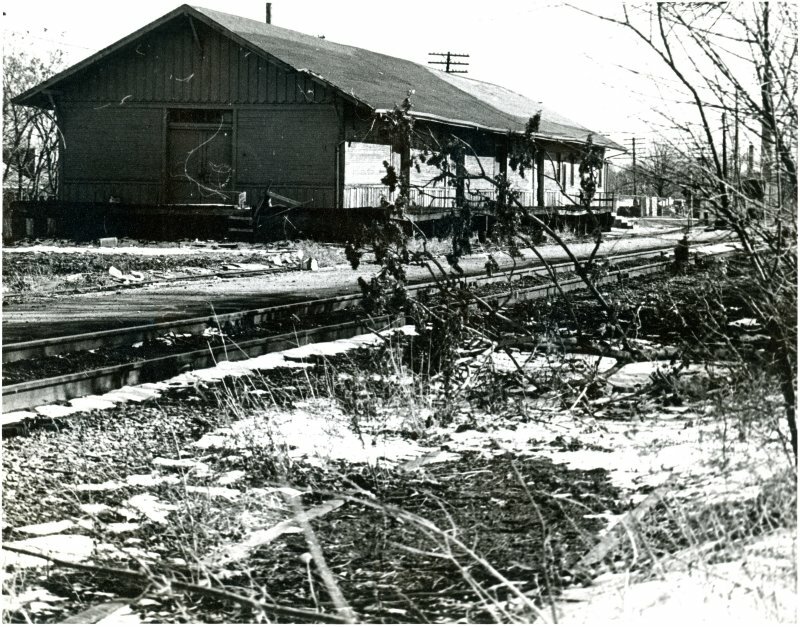 Across the tracks to the left, was an ice house. 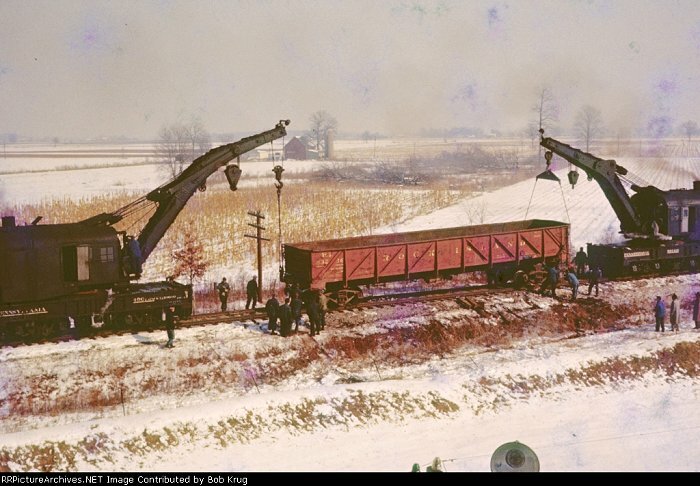 This was very common practice then for filling ice cars (refrigerated cars) to prevent perishables from spoiling. 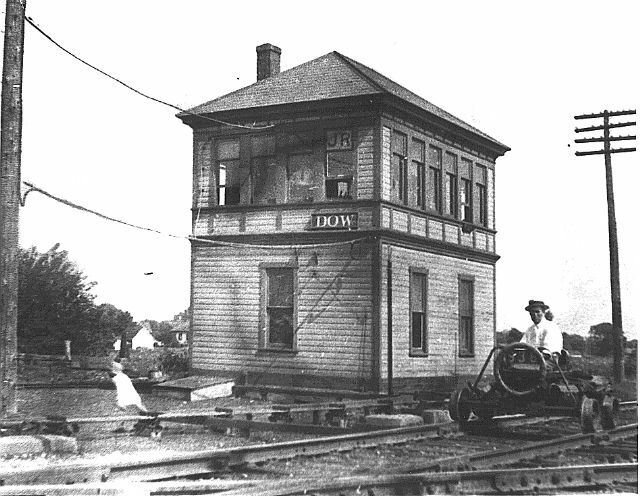 The Dow guarded the crossing of the Big 4 and the PRR in North Anderson. 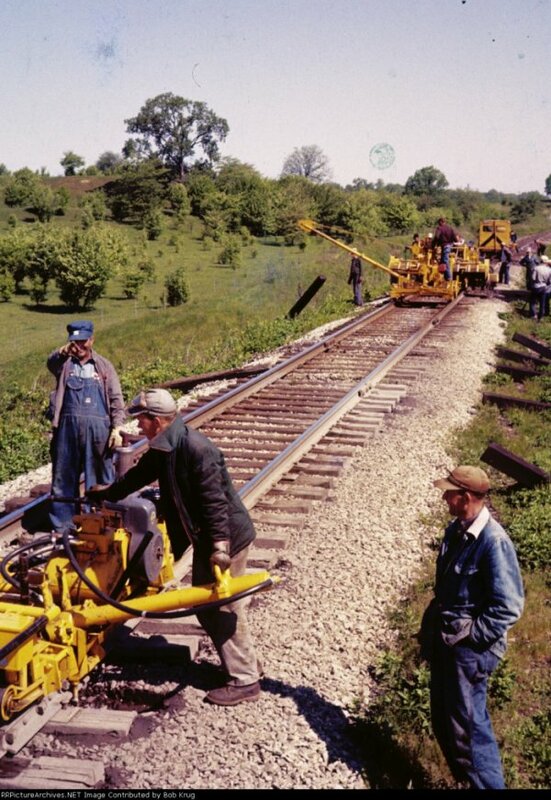 It also was responsible for the tracks running both North and South from there. 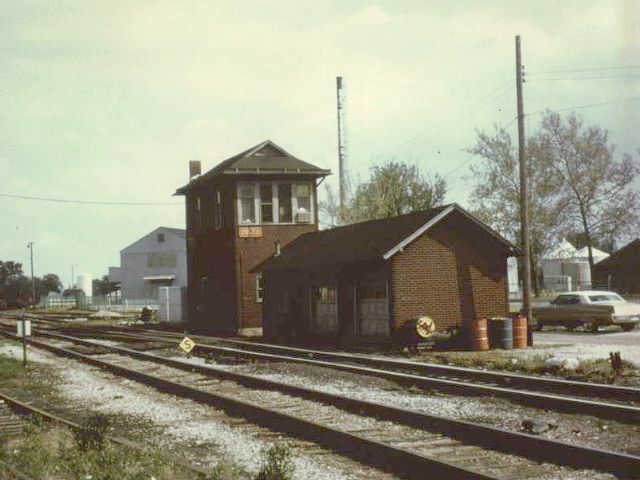 The coaling tower and tracks at Florida Station were under it's control. 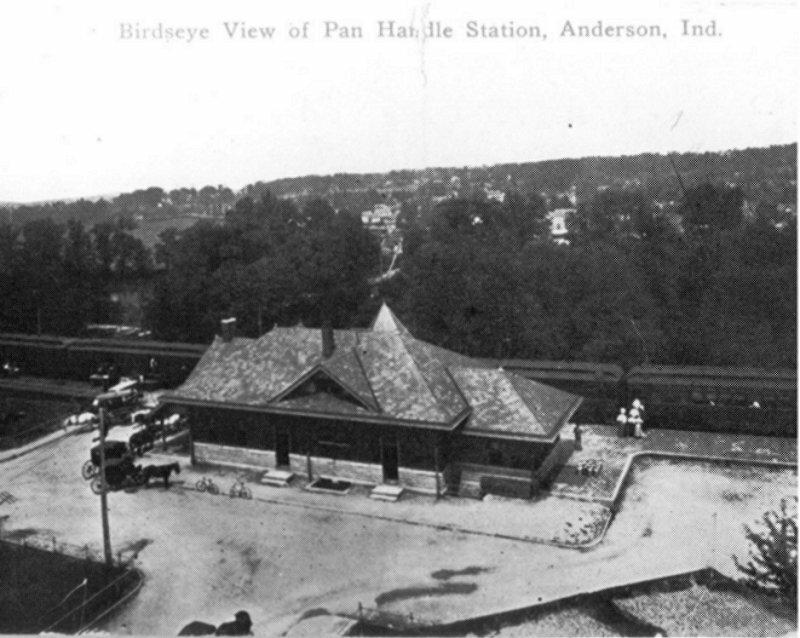 A bird's-eye view of the Pennsylvania Railroad yards, south of Union Station in Indianapolis, which is seen in the background. 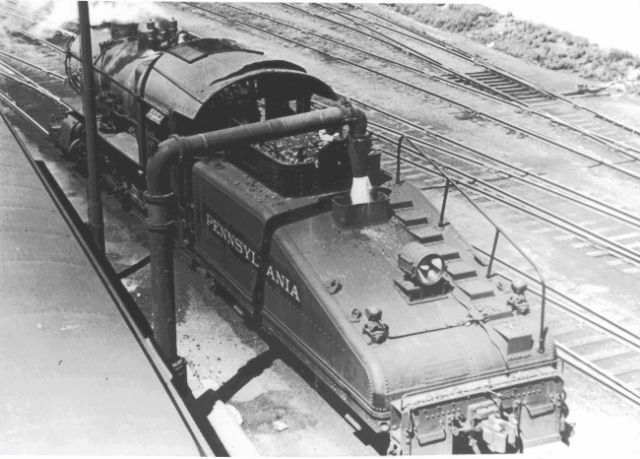 A train is on the tracks in the center, and freight cars are visible on the right. 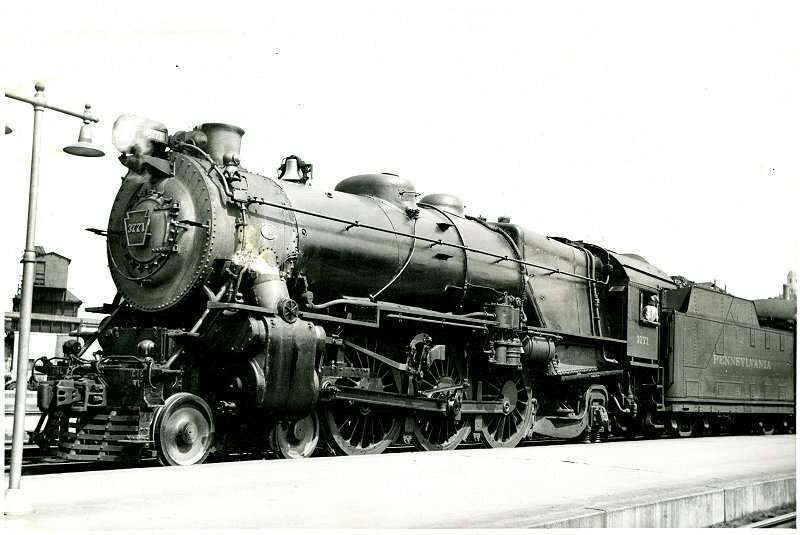 It was just after 3 o'clock Sunday afternoon Jan. 9, 1938, when an Indiana Railroad city passenger bus en route downtown from North Anderson stopped about 10 feet before the railroad crossing. 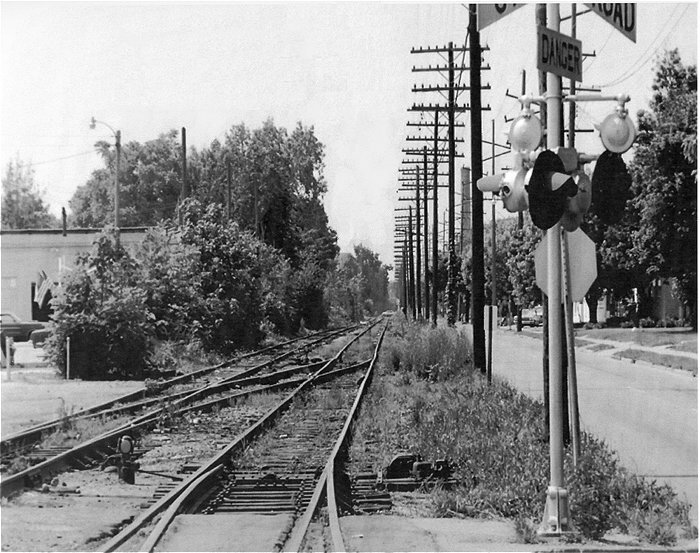 The driver looked both directions before driving onto the tracks but did not see the approaching train. 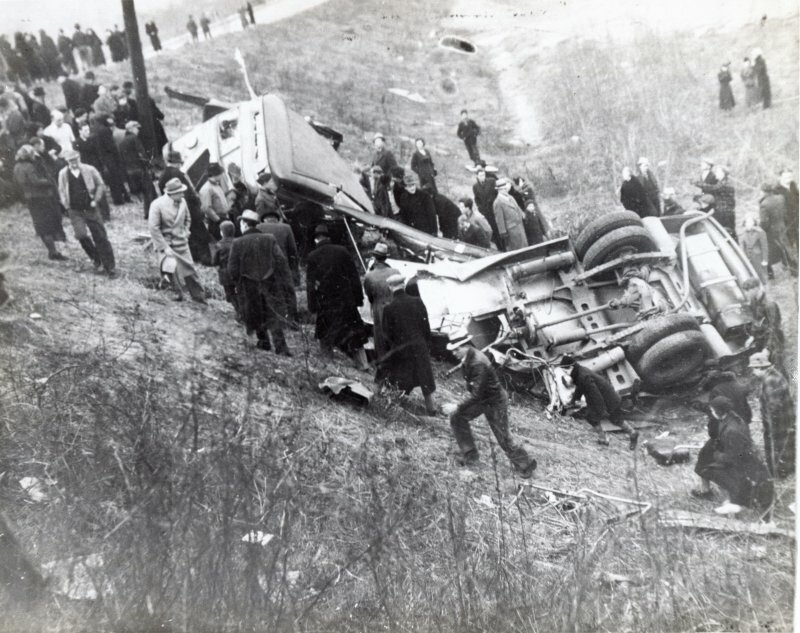 After waiting for about 15 seconds, the bus gradually pulled onto the tracks. 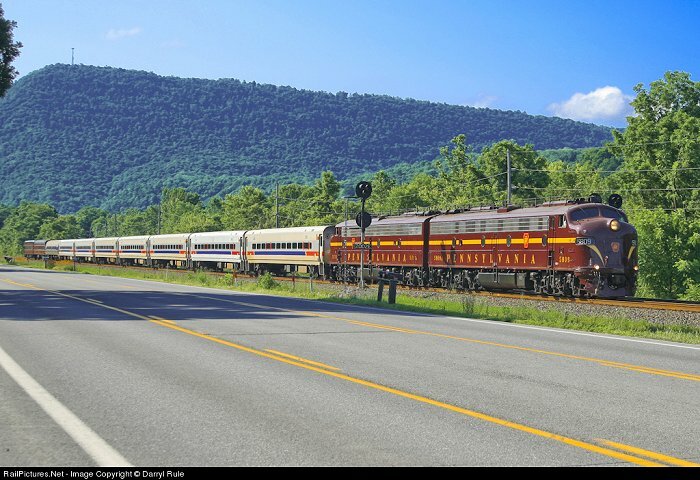 At that same moment, the eyewitness observed the engine of a rapidly approaching southbound Pennsylvania passenger train looming over the bus not more than 35 to 40 feet from Jackson. 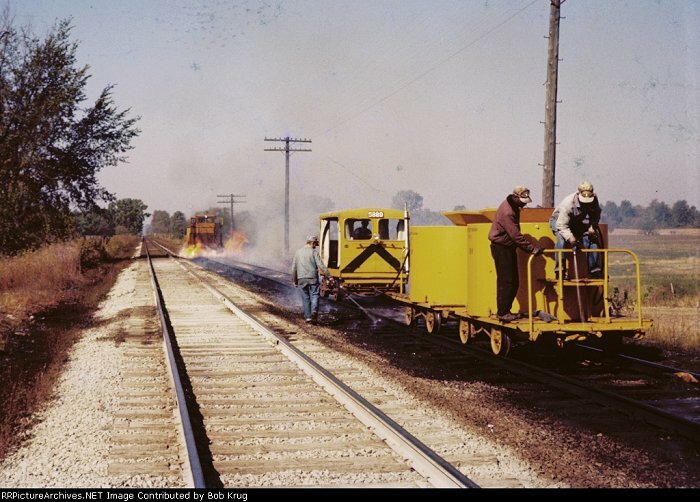 The ensuing collision was described simply as a yellow streak hurtling through the air with dust and papers flying in all directions. 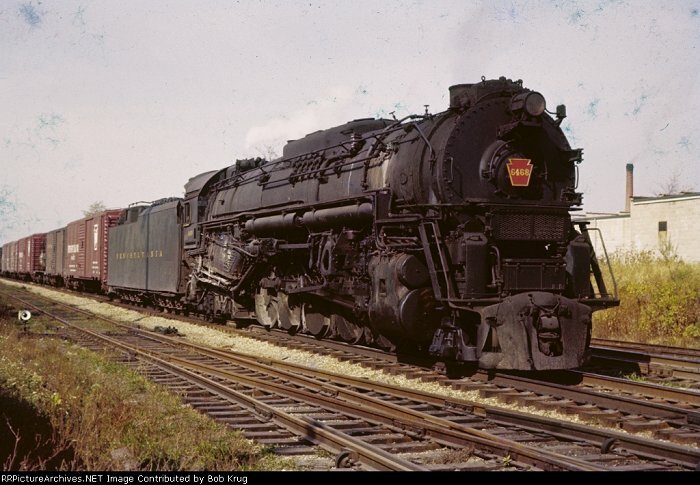 The steam locomotive struck the bus a short distance behind the right entrance door and split the vehicle into two sections hurling both sections through the air and down a fifteen foot embankment on the east side of Jackson Street. 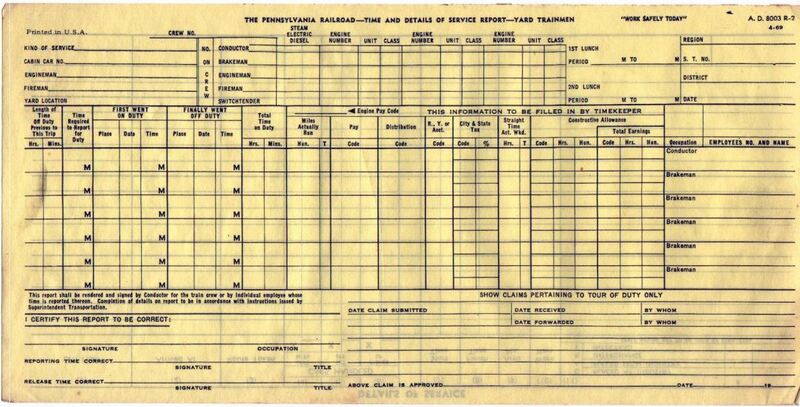 Members of the Pennsylvania train crew placed the time at nine minutes past three. 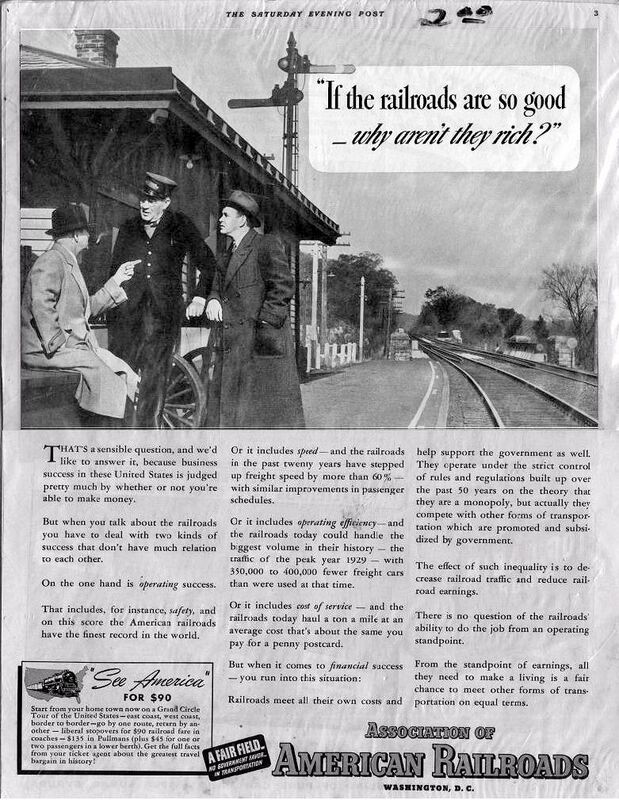 "If the railroads are so good, why aren't they rich"
Wendell L. Willkie Special North of Anderson in 1940. 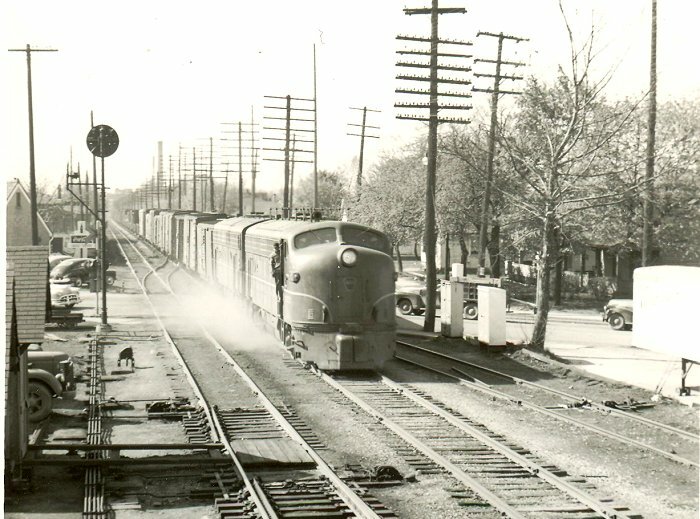 The sidings in the photo were controlled from JR Tower (DOW) at Cross and Indiana Ave. Willkie traveled extensively by train during his campaign for President. 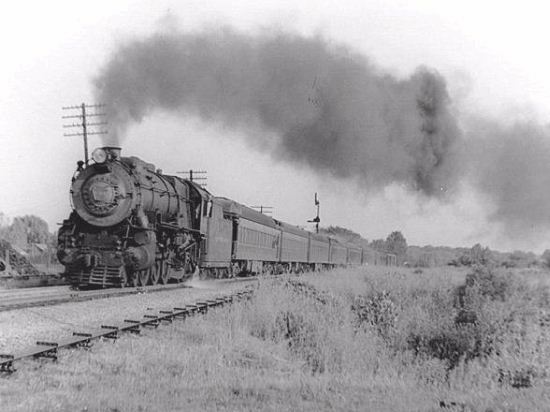 At Richmond before it was renumbered to 1525. 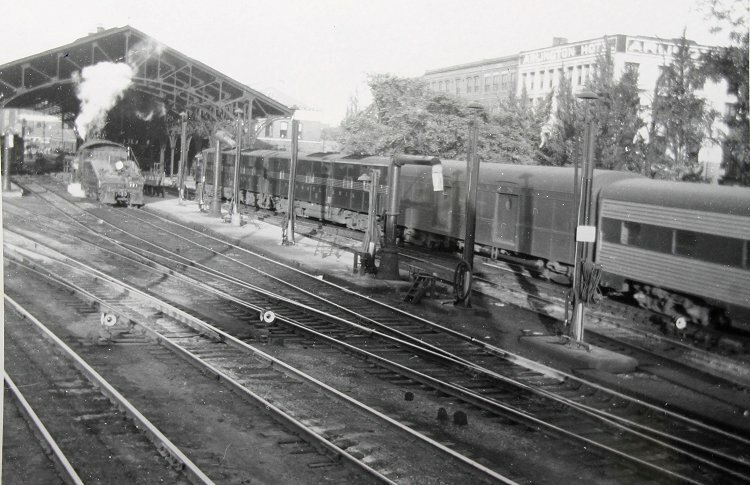 The PRR Yard at 5th and Main looking North. 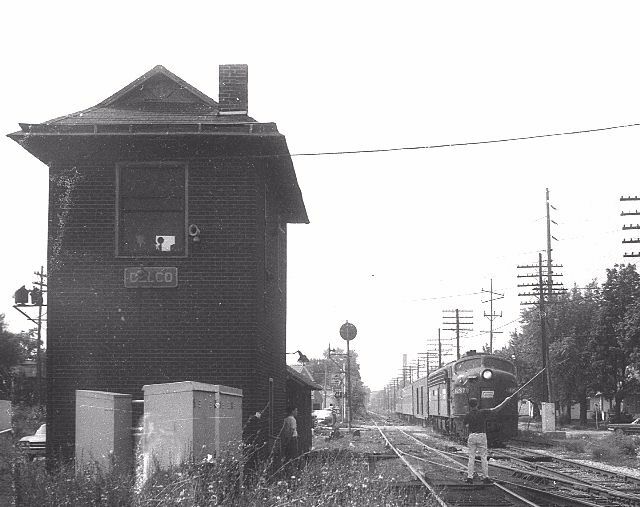 John Pickett writes: "Richmond Station with shed, probably taken in 1948. 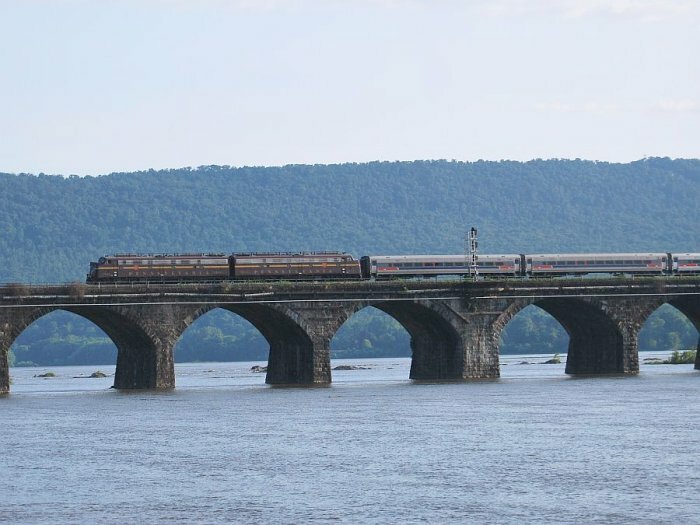 East bound Penn Texas arriving Track 1 - passing westbound diesel fuel towers. 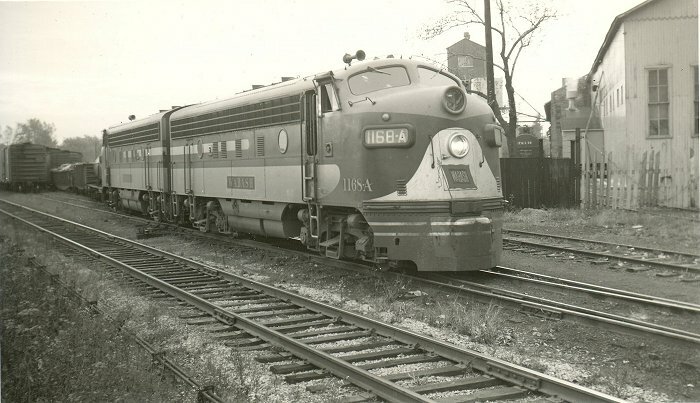 John Pickett writes: "The T-1 that I rode behind from Dayton area on Nov 1, 1950 pulling Jeffersonian, all coach NY to St Louis. 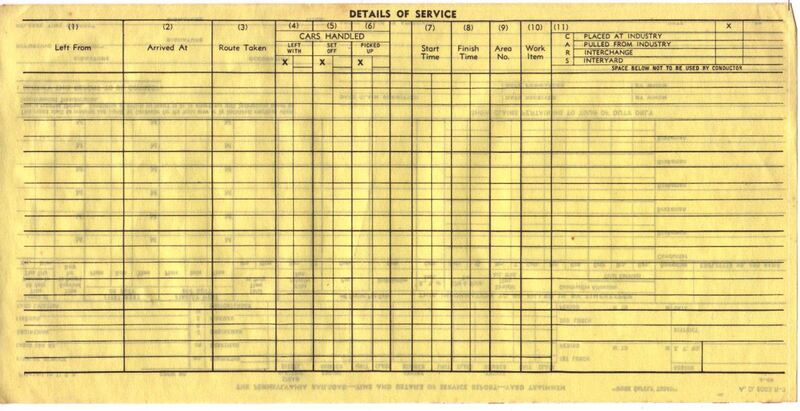 No diesel fueling towers needed that day. 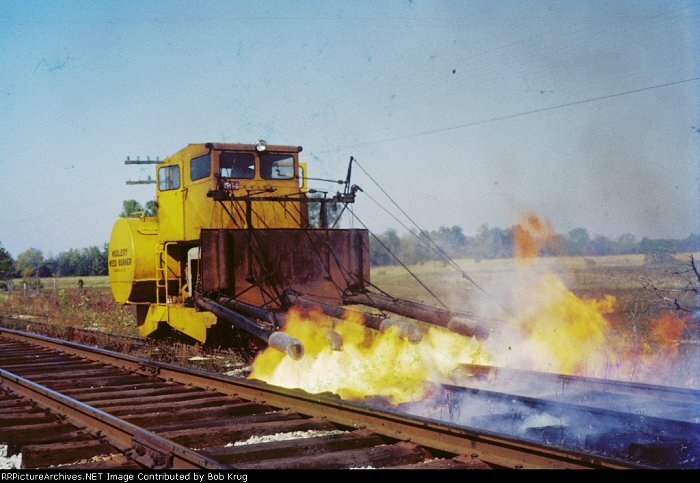 Track 3. 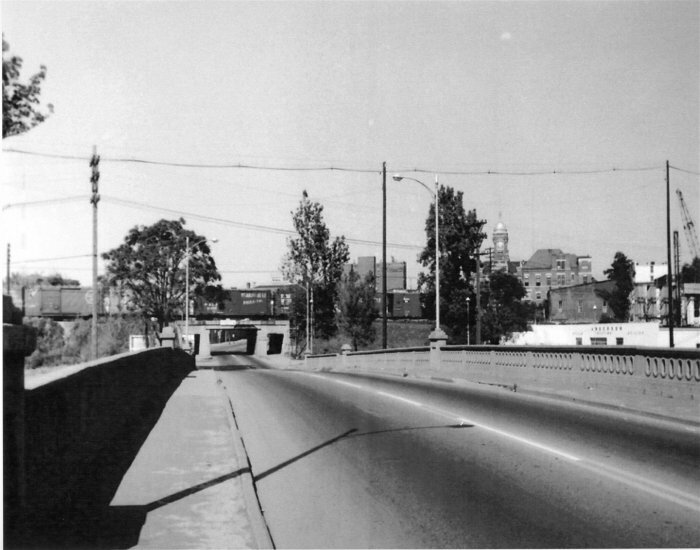 9th Street curved to right going north as seen in extreme left of picture in Richmond. 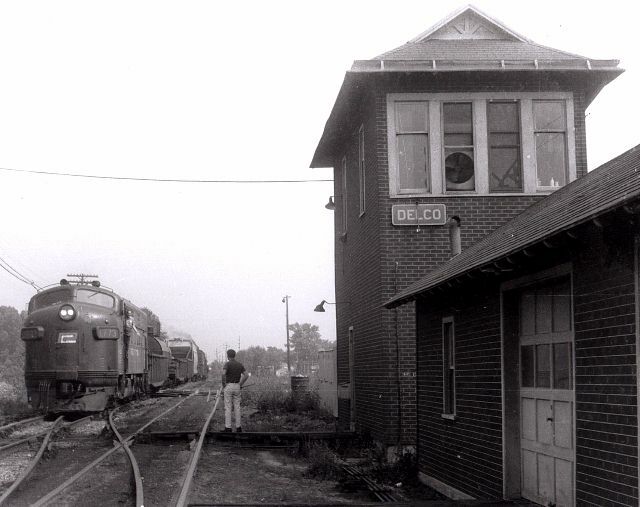 Prr southbound at Delco Tower in Anderson - Head End prepares to pick up orders. 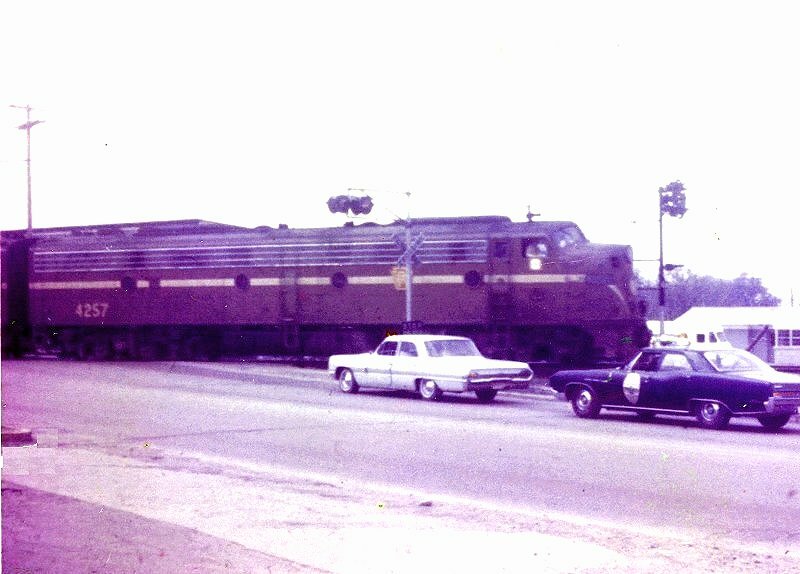 sometime in the '50s. Photographer unknown. 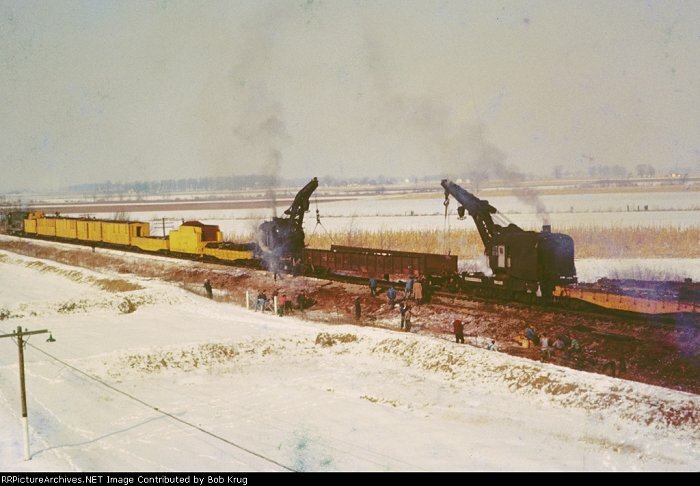 The following photos were taken by Maynard Krug. 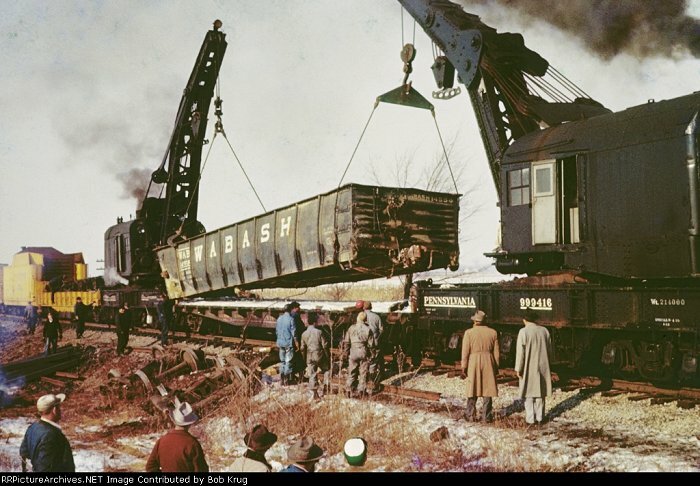 Bob Krug has placed them on rrpicturearchives.net. 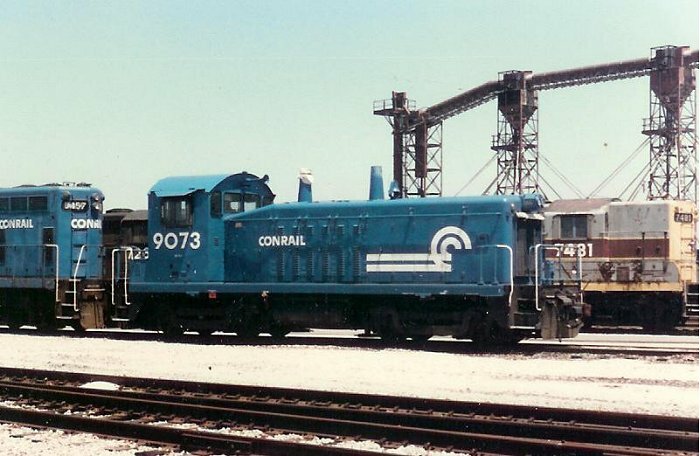 PRR 999416 (MofW Equipment) CRIP 83236 (Gondola). 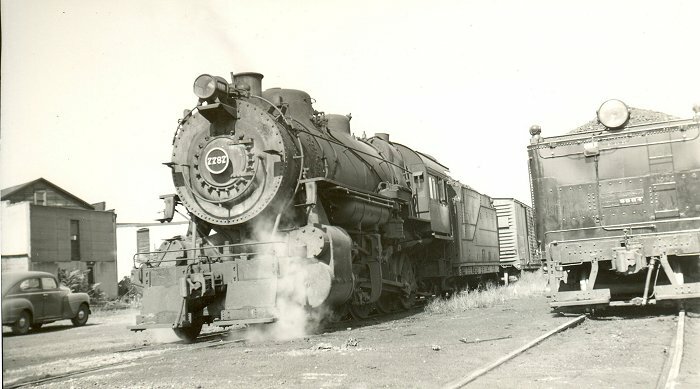 Dad was transferred by the PRR out to Anderson, Indiana, where he was track supervisor of the PRR's Richmond Branch, which ran from Richmond to Logansport, IN. 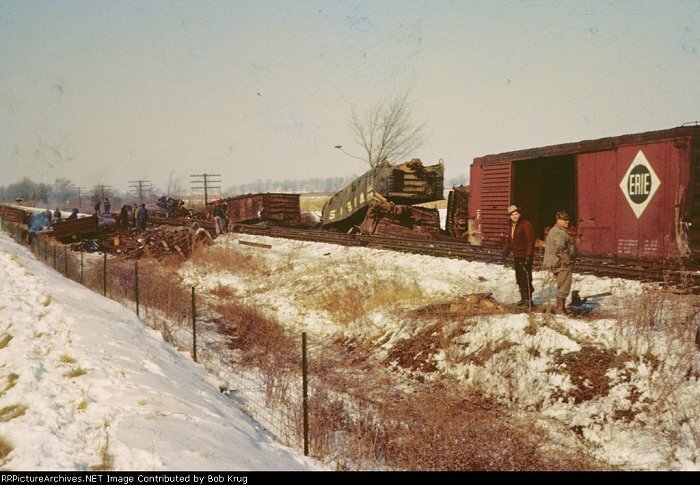 This was his first train derailment on the Richmond Branch. Call out the BIG HOOKS! 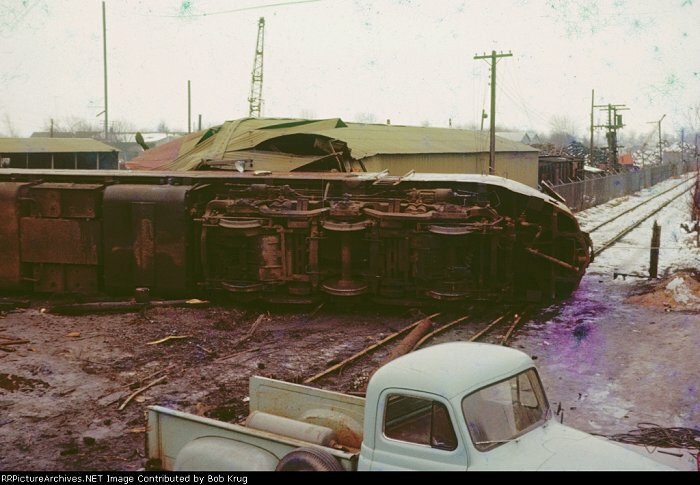 PRR Baldwin Sharknose 5778 lies on its side in Kokomo, Indiana. 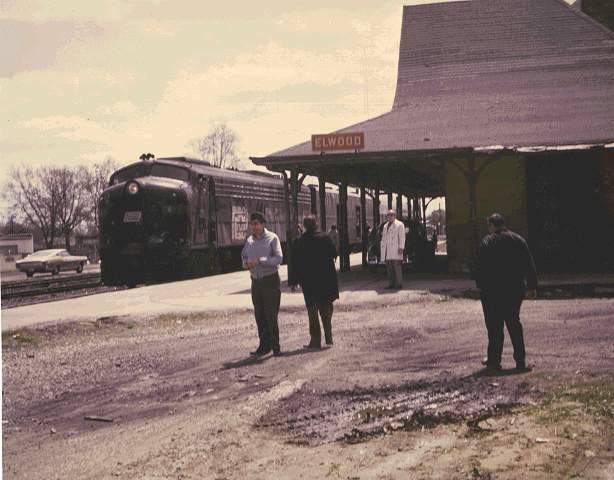 This was PRR passenger train #208, which ran from Chicago to Cincinnati. 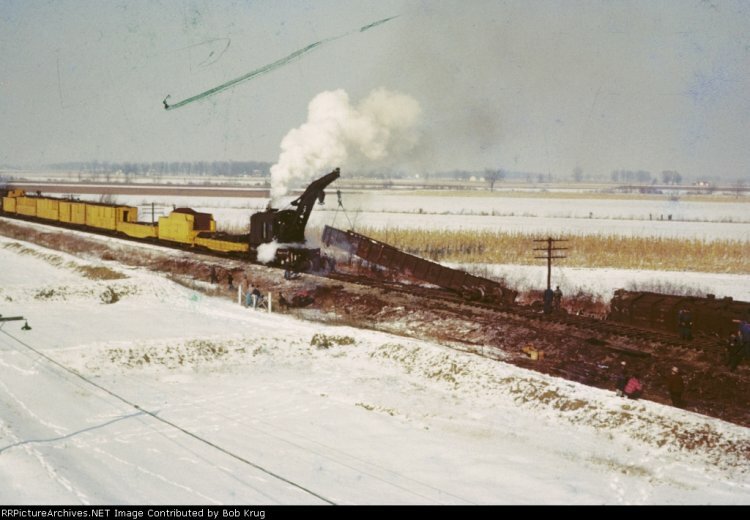 The train had made it's regularly scheduled station stop in Kokomo, and was accelerating southbound when the lead engine was diverted by a mis-thrown switch onto an industrial siding, the curvature of which caused the lead unit to tip over from inertia. 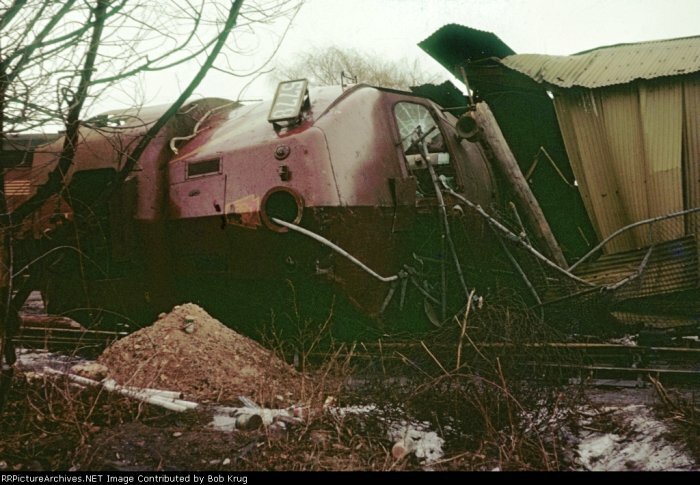 Fortunately the train wasn't rolling at high speed yet, and the engineer and firemen both survived. 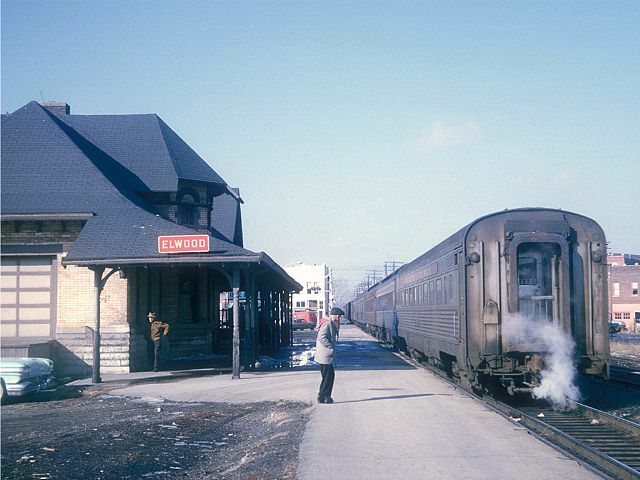 None of the trailing cars tipped over, and there were no injuries among the passengers or train crew. 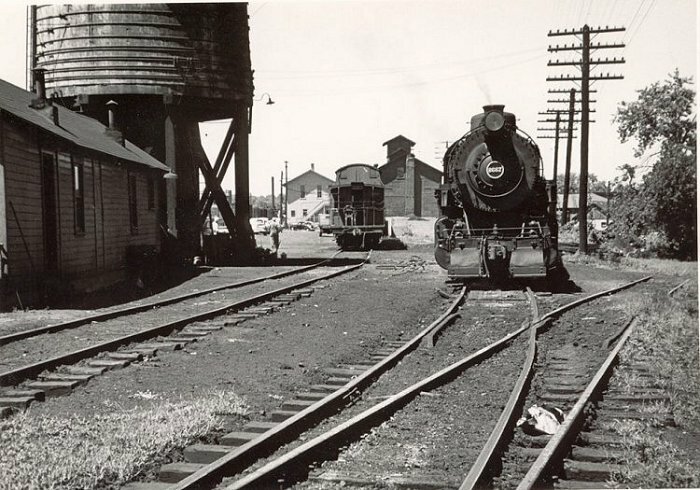 Subsequent investigation determined that the switch had been thrown by a young boy (approx age 10-12) who had somehow obtained a switch key, unlocked the siding switch, and thrown it ahead of the train. 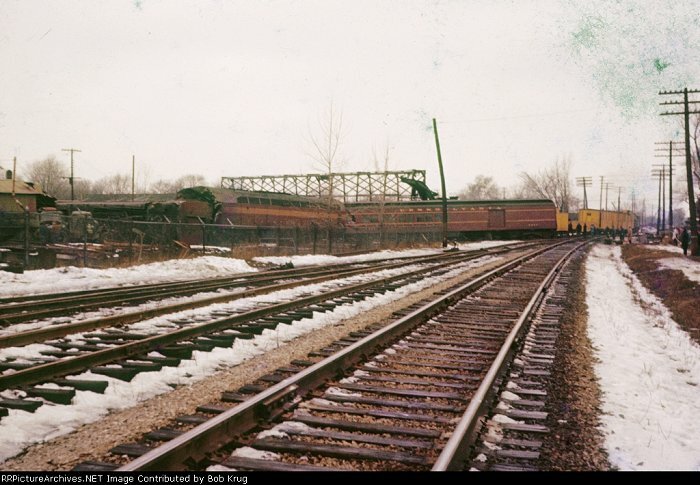 While waiting for the day passenger train for a return inspection trip back to his home base in Anderson, IN, my father, who was track supervisor on the PRR's Richmond Branch snapped this slide of a Pennsy Class J-1 behemoth. 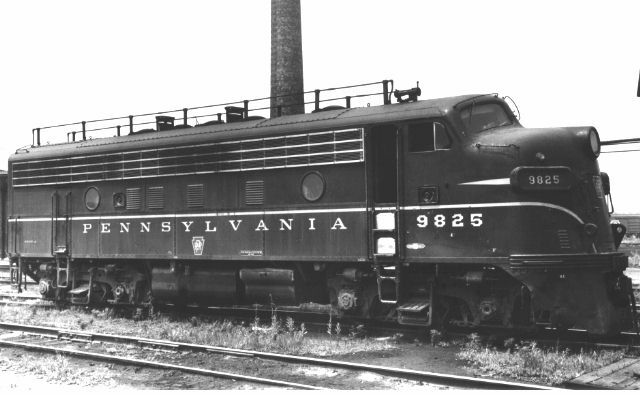 The J-1 class was Juniata built, but copied from a C&O design. 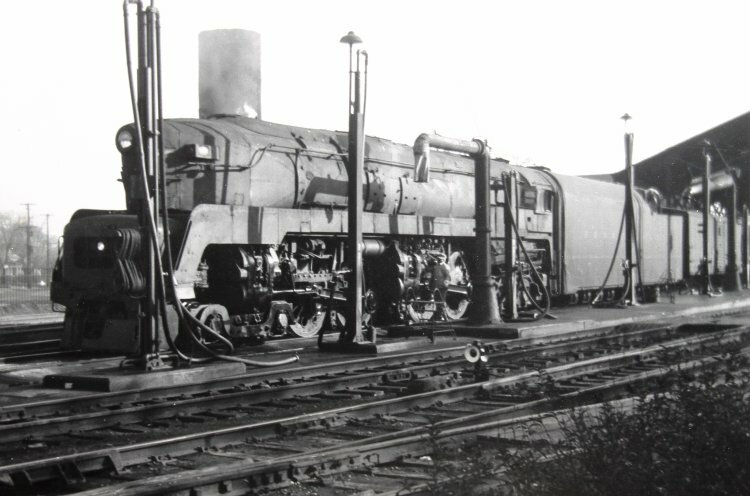 It lacks the belpaire firebox / boiler commonly found on other PRR steam locomotives, and sports a keystone smokebox number plate instead of the round number plates found on most other classes of PRR freight locomotives. 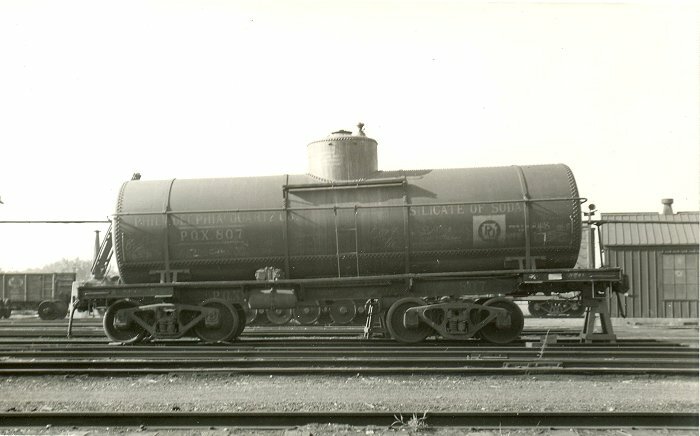 According to Dad, the J-1 was a water hog; even with that big tender, it had to be watered frequently. 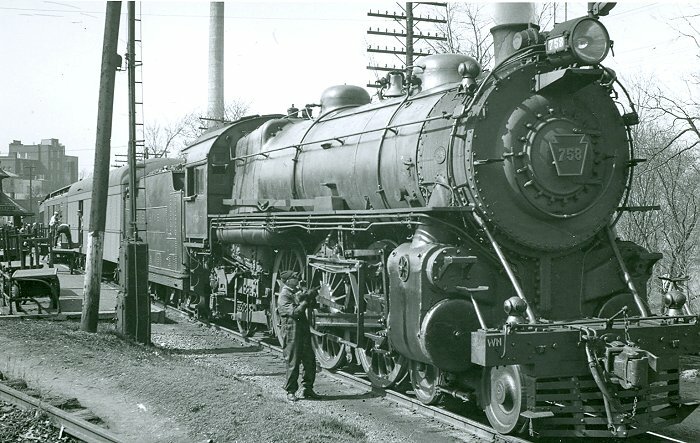 Dad also said the J-1 class tended to stay on PRR Lines West in the twilight years of Pennsy steam. 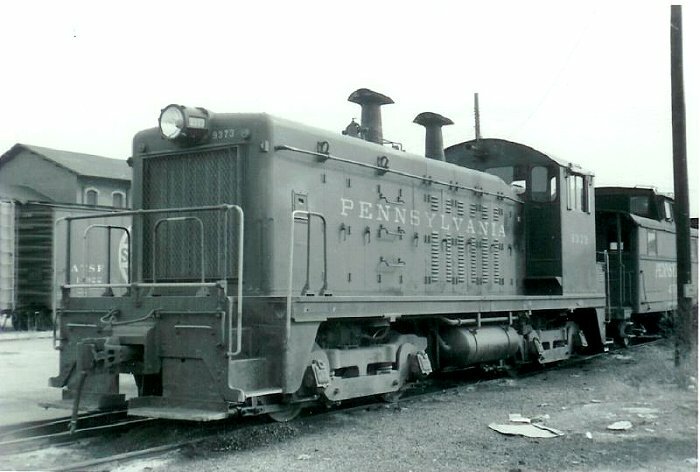 All Pennsy J-1's were scrapped; none survive. 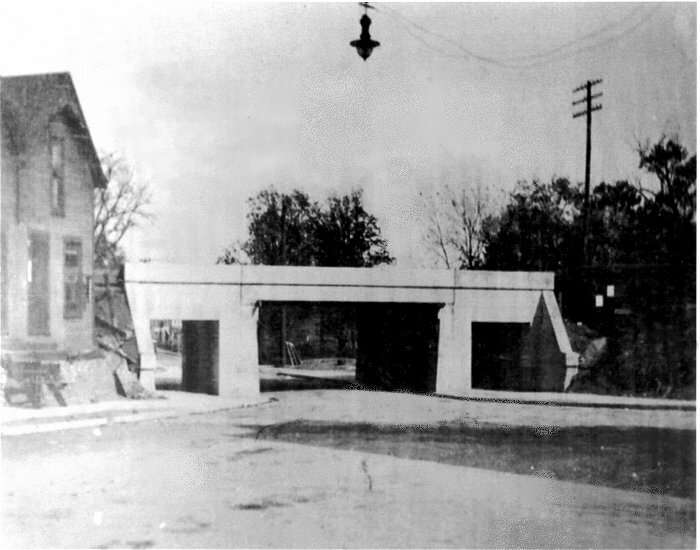 Crossing Broadway in Anderson. 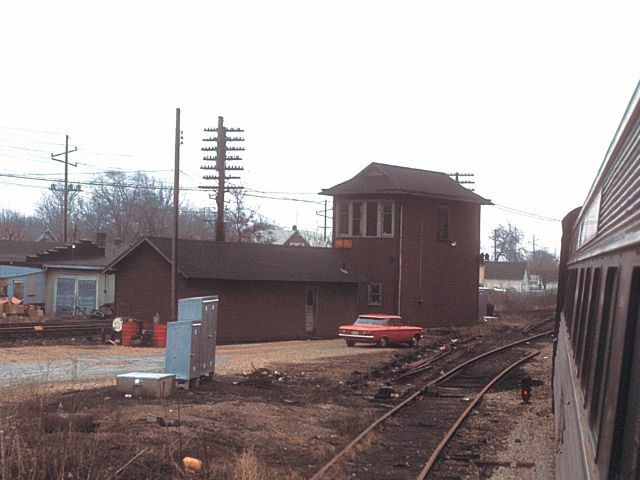 Roger Hensley Photo. 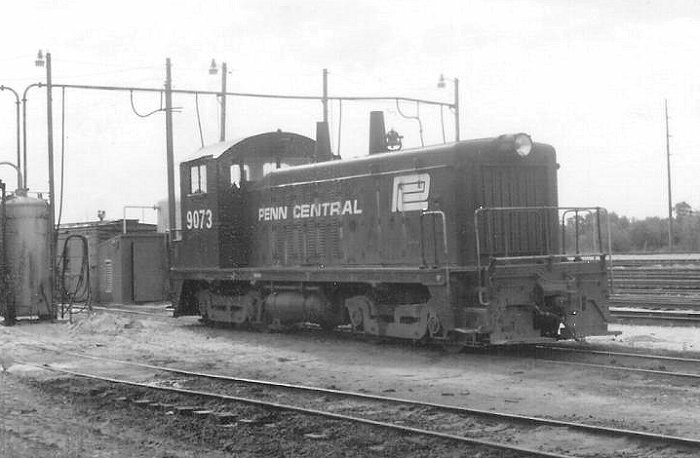 Penn Central EMD SW 7 (PRR Class ES12) 9073 (renumbered from PRR 9373) in mid-'70s at Anderson. 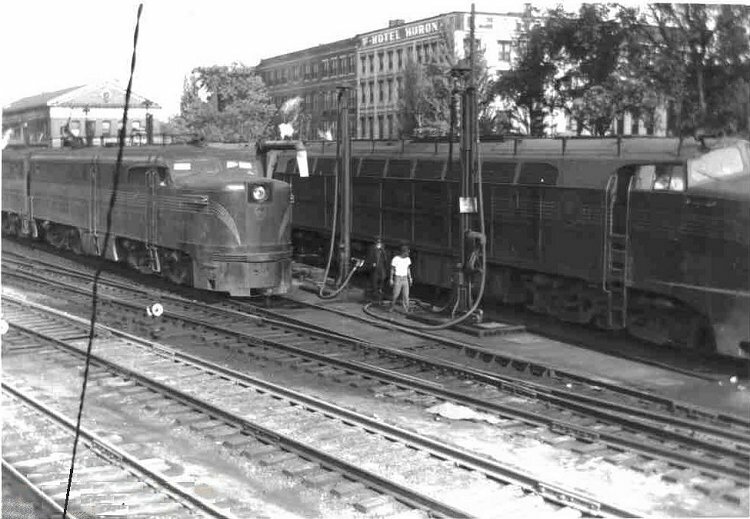 Passenger train getting ready to receive orders. 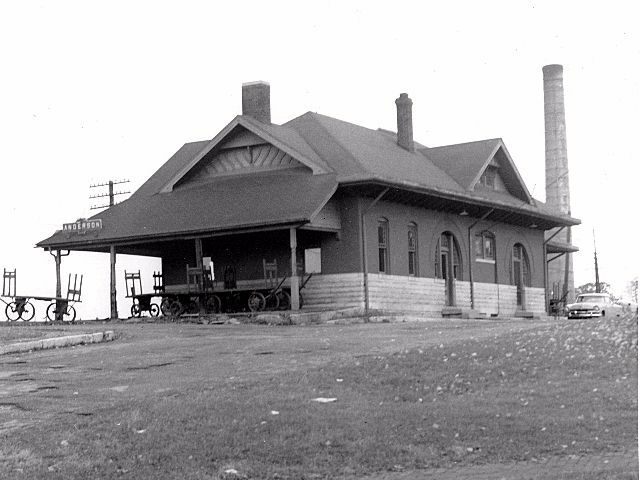 This is the same freight station in the photo from 1910. 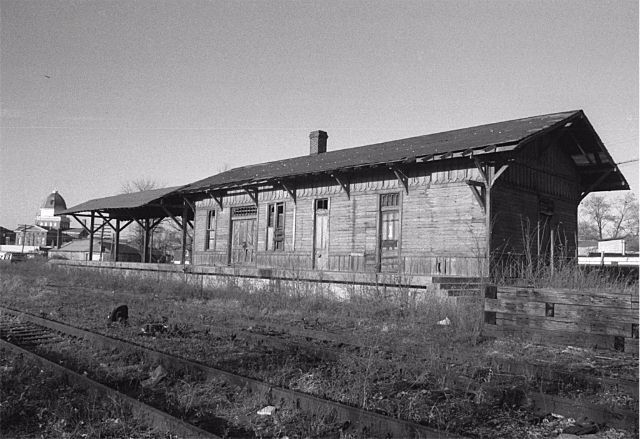 The front second story has been removed and the front turned into a passenger station. 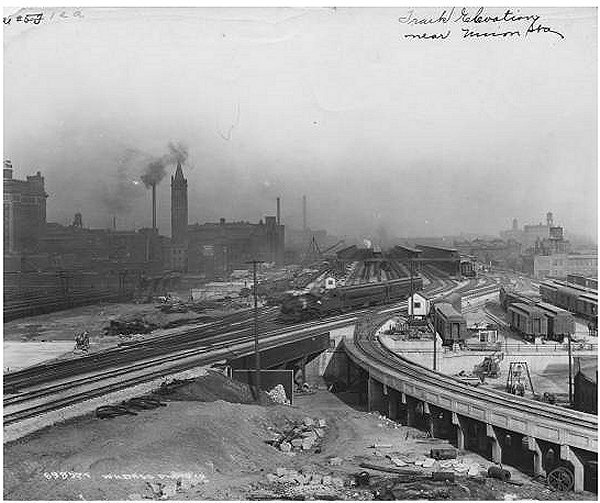 PRR Railroad along Cincinnatti Ave. from 18th Street looking North toward the city. 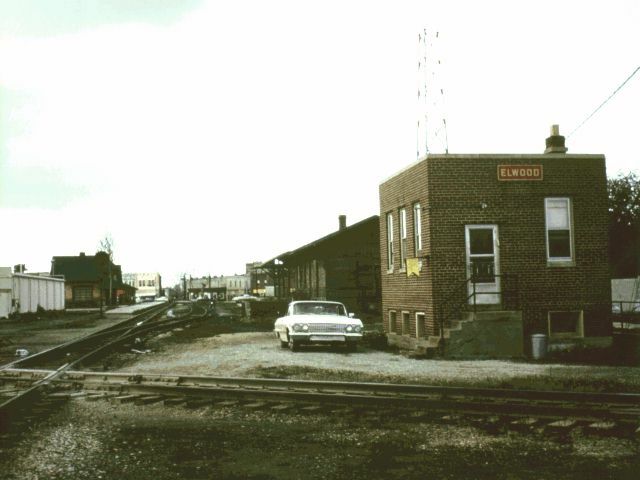 View of the PRR train station in Elwood, Indiana. 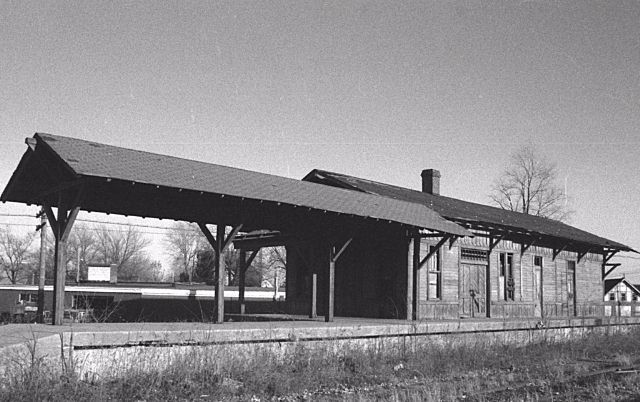 The depot is made of brick and stone. 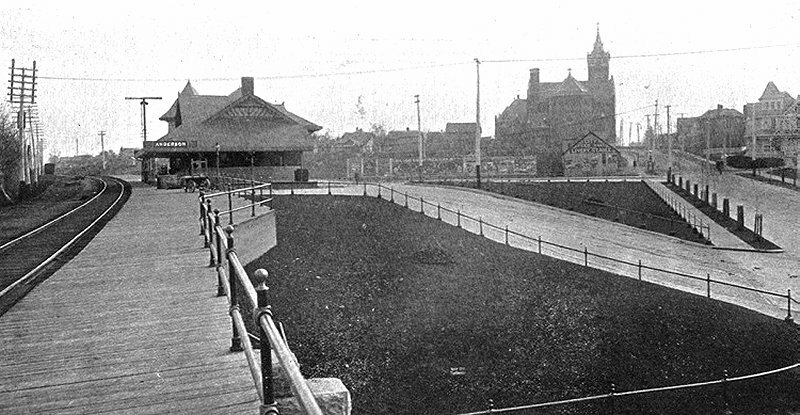 Four people are near the building, one of them is sitting on a bicycle. 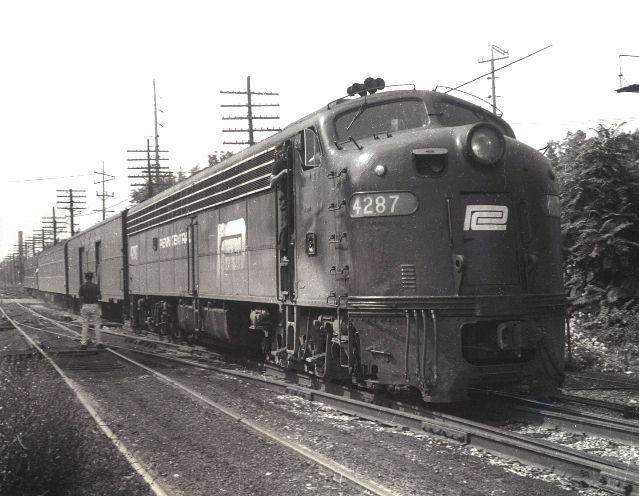 The picture here is of the last Penn Central Passenger Run Northbound through Elwood. 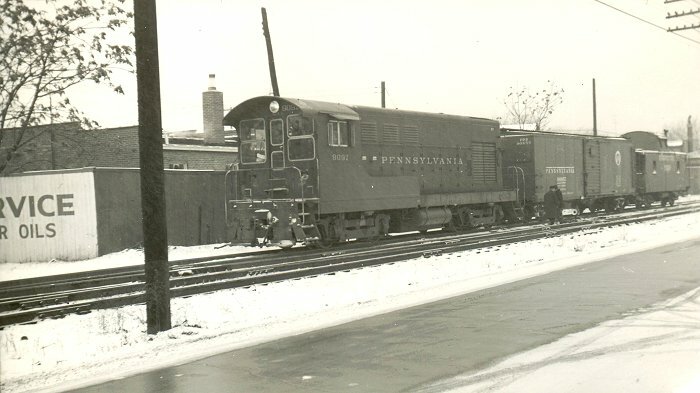 These two E8s have been restored in Pennsylvania colors and placed in operation on excursion duty. 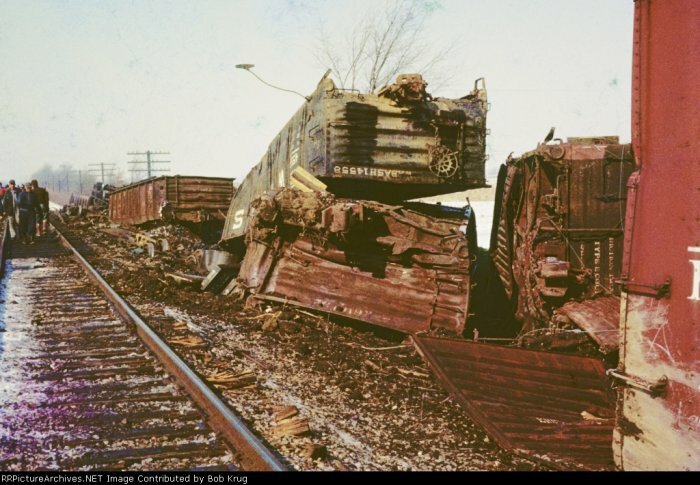 Copyright 2002-2018 by Roger P. Hensley. All Rights Reserved.